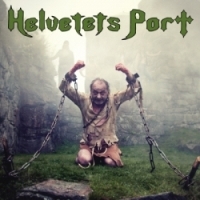 After plunging their axes into the ash pits of Hell, they come back with chains to solid ground.With a show of true Metal, in the image of NWOBHM, the obscurity of the early 80's continues with another release by the Swedish group, HELVETETS PORT or in translation THE GATES OF HELL or HELL'S GATE. No matter what name you pick, it is still the same music. Last year, the team led by Witchfinder, released their debut album, "Exodus To Hell", through High Roller Records. Near the end of 2010, the band had to make their statement that regarding their works on some new material, so they send us a small welcoming gift with the small EP of "Man With The Chains". If you know these guys, you won't be surprised even for a bit of what they did on this little release and if not, just give a small glance on their leather clothing. Unlike many other newly found old school bands that decided to carve NWOBHM on their banners, HELVETETS PORT did everything in their power to be a vintage like band. Well, you don't need their new release to remind you that as it clearly shows on their earlier releases. Moreover, the musical direction remained the same as it was previously, the same vintage British touch of the glory days of NWOBHM. Nevertheless, the recording of "Man With The Chains" recording took even a much wilder turn. In comparison to "Exodus To Hell", this EP seemed to turn out even more unpolished than before. In an age where even old school bands tend to polish their sound, HELVETETS PORT took the opposite direction with a desire to sound even more old school and obscure. I have to give to them, they succeeded, even if there are a few fixes that could be, especially in the production of the drum set, which in the process of mastering the bass drum line was practically unmentioned as it can only be heard with a very sharp hearing or a very high volume. Other than that, I appreciate their efforts on trying to go "backwards" instead of marching into new trends. As I said earlier, musically HELVETETS PORT didn't change a thing. Their trio displayed tracks haven't shaped anything new to me, or probably to you as well, yet, I couldn't ignore their way to create vintage like songs. Riding between the epics of "Crusaders Must Ride" (the band's best track on this EP), the horrific urban ghost legend of "Man With The Chains" (a very nice villagers cry in the chorus section) and a some sort of a wild fictional feature of "Lightning Rod Avenger", HELVETETS PORT show that the future is the same as the present. The same respectable quality displayed on their earlier stuff is here to stay. Keep it up guys!! !